(Nanowerk Spotlight) Thomas Edison likely created the first commercial carbon fiber when he produced high-resistance carbonized filaments by heating cotton sewing thread and bamboo slivers to power an incandescent light bulb. His lamp shed light for 600 hours introducing the first reliable, marketable light bulb and laying the foundation for a new field in chemistry that would be introduced more than a century later with the invention of covetics. This new class of materials also marks a game-changer for engineers and designers that have long sought to combine high-strength carbon with metal in their pursuit to improve metal’s performance. For the first time the hybrid fuses nanocarbons and metal in a bond that is stronger than graphene-like sp2 carbon bonds. To create covetics, co-inventors Jason Shugart and Roger Scherer, Ph.D., developed a new method of carbon catalyzation which uses molten metal and metal alloys as an ionizing medium. Nanocarbon structures form in situ while bonding to the metal ionizing medium. Initial testing revealed that covetics responded to physical deformation more like polymers than metals. In addition Shugart and Scherer found they could control the chemical reaction and the ingredients to tailor covetics to end-use applications. Much like graphene, called “the next wunderkind material” because of its extraordinary properties, the potential uses and advantages associated with covetics are seemingly endless. “We knew immediately that we had something,” says Shugart. Shugart is president of Waverly, Ohio-based Third Millennium Materials LLC (TM2). To date, the hybrid has demonstrated the ability to withstand more than 1500 degrees Celsius under an oxygen plasma lance without separation of carbon and metals. Shugart adds that because covetics are carbon compounds that use different metals, potential users will have to gain an understanding of carbon and its effect on the properties and behavior of the material. Covetics promise to deliver superior properties for advanced engineering applications but the hybrid presently defies classification and the nature of its chemical bond is still a mystery. The material continues to confound universities, national laboratories and the military. Despite years of traditional tests and analysis, these organizations could neither qualify nor quantify the presence of carbon in covetics. 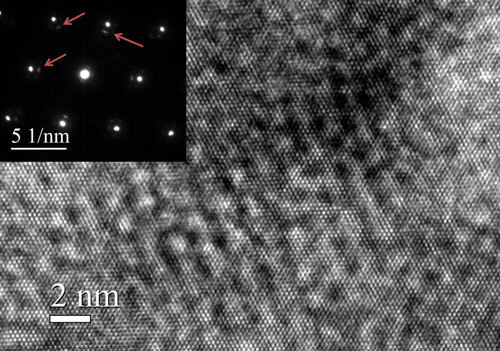 It wasn’t until 2007 that a Chicago-based materials testing laboratory was able to confirm the presence of carbon using Transmission Electron Microscopy. “So the question then became: what form of carbon is it?” says Shugart. Dr. Salamanca-Riba’s investigation included among other things use of an Energy Dispersive X-ray and Electron Energy Loss Spectroscopies. The spectroscopy employed high energy electrons which induce electronic excitations within the sample’s atoms producing a signature energy that identified the element producing it. TM2 was awarded U.S. patent 8,349,759 on January 8, 2013 for the metal-carbon composition and the invention of silver covetic. 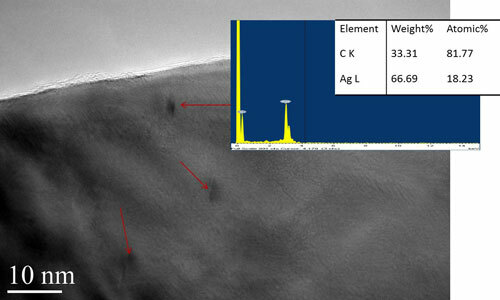 Five additional patents will be issued in 2013 for copper, gold, zinc, tin and lead covetics. To date, TM2 owns the intellectual property for covetics based upon 15 elements. Dr. Salamanca-Riba’s ongoing work with covetics is focusing on understanding the role of nanocarbons on the structure and properties of metals, how the bonding process between carbon and metal occurs and discover the mechanism that makes the bond so strong. Testing and application work with the military have already demonstrated the hybrid’s ability to improve thermal and electrical conductivity and yield strength and resist corrosion and oxidation.